So, last night we went to a peas festival just outside of Vicenza. I know, we are so rock’n’roll! But, hear me out. On one hand, festivals called ‘sagra‘ and dedicated to a single foodstuff are held all over Italy and attract huge crowds. On the other hand, the peas that we went to sample, turned out to be the best in the country. And, most likely, the continent, too. The other day I got back home carrying ten kilos of peas. No, I am not kidding. We are right in the midst of pea season here – a less than a month-long period when crates full of peas still in their pods take a pride of place in every fruit and veg shop. As it happens, we live in something I can only describe as ‘pea country’. Apparently, the soil in the Northern Italian region of Veneto is especially suitable for the growth of peas and the resulting crops are valued all over Italy. 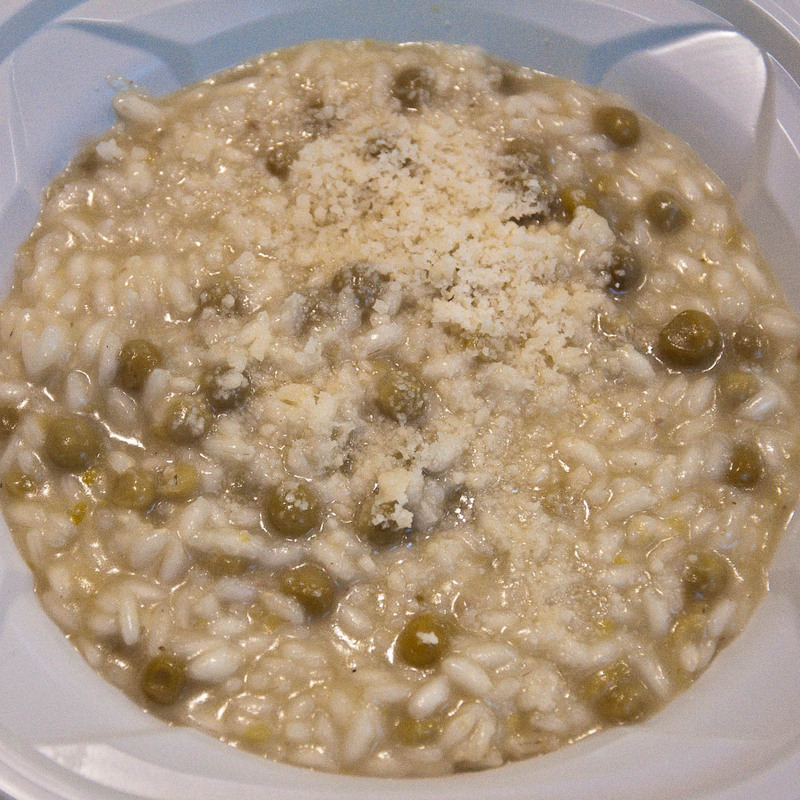 The most famous local dish is called simply ‘risi e bisi‘ – a mixture of rice and peas in meat broth, which is somewhere between a risotto and a soup. I had read about it before we moved to Italy now over a year and a half ago. It was described as a deceptively simple, yet delicious dish, which, immediately, I wanted to try. Somehow I didn’t get a chance to do it last year, so when this month of May my local fruit and veg shop started stacking high crates of peas in their pods, I couldn’t resist and got a whole crate for us. How could I have not? At only 1.30 euros per kilo, it was a bargain. Plus knowing that it had traveled less than a dozen kilometres to reach our table gave me that smug glow of satisfaction which you get when you manage to eat healthily without investing too much time and effort in it. Anyway, I dragged my ten kilos of peas to the flat, upturned one of two bags stuffed with pods on the kitchen table and inadvertently found out that shelling peas is an activity able to keep an active toddler happily occupied for a long time. I would split the pods open, marvel at the size and number of peas tightly packed in each one of them and then pass the pods to my little daughter who would empty them in a huge bowl. We worked like this in happy harmony, the repetitive tasks our hands performed building up a rhythm of their own. The pile with split empty pods soon grew higher and higher up and we had just filled the bowl with fresh peas and moved onto a second one, when my parents skyped from Bulgaria. They were a bit shocked to see what was keeping us occupied on a fine Italian afternoon. Their eyes grew even bigger when I showed them the size of the local peas. They were as big as the diamonds celebrities wear on their fingers when they get engaged (but, anyway, the peas tasted better, much better than that!). ‘Are you going to freeze the peas?’, asked my mum, who is a master of fruit and veg preservation in any possible way. ‘No’, I said, ‘we are going to eat them fresh’. And so we did. I half-boiled/half-steamed a huge portion of peas as a side dish for our meal that night. The evening after that I served pasta with peas. The peas were very tender, very soft. They had a fresh green flavour and felt like rich butter on my tongue. (Nothing like the tinned peas which had spent months in a colourless liquid and leave a metallic aftertaste.) And even though I had never been big on peas, I just couldn’t get enough of these. Just comes to show how things taste so much better when eaten fresh and haven’t traveled thousands of miles. After successfully serving peas two evenings in a row, I decided to attempt the local traditional dish – the fabled ‘risi e bisi‘. It seemed simple enough. You saute some chopped onion with rice in a pan, then toast the rice for one minute, add the peas and then slowly drizzle some hot stock for the entire cooking time. Easy-peasy! That was until I read that the dish had to achieve a very specific consistency. It couldn’t be left thin as a soup, nor it could be made too thick as a risotto. It had to be somewhere between the two and a very specific Italian term was used to describe it: ‘all’onda‘, meaning that the rice with peas needs to slide as a wave towards the rim of the pan when you tilt it. 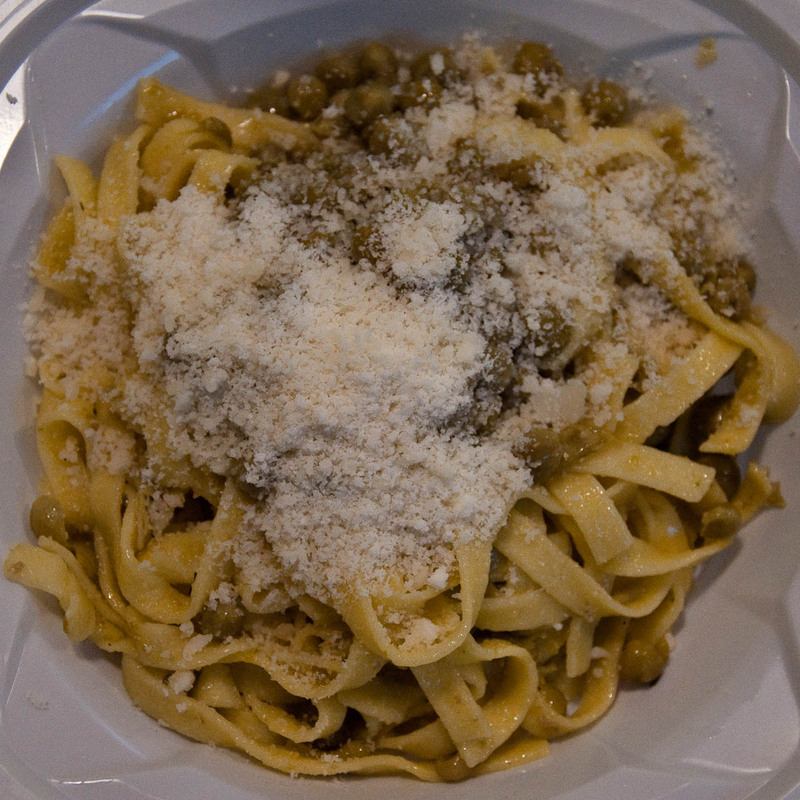 It also transpired that risi e bisi was the dish which used to be served to the Doge of Venice on 25th April – Saint Mark’s Day – every year for centuries. So, suddenly I was under a lot of pressure to do it justice with my somehow limited culinary skills. Thank God for mindlessly browsing the internet when you are trying to postpone a daunting task! As this is how I came across the website of Lumignano’s Pea Festival. Lumignano di Longare is a small village just outside Vicenza. Cuddled at the bottom of the Berici Hills, I had glimpsed it from afar a couple of times as we were travelling down to such medieval jewels like the walled city of Este and the stone village of Arqua Petrarca – the resting place of the poet Petrarch. 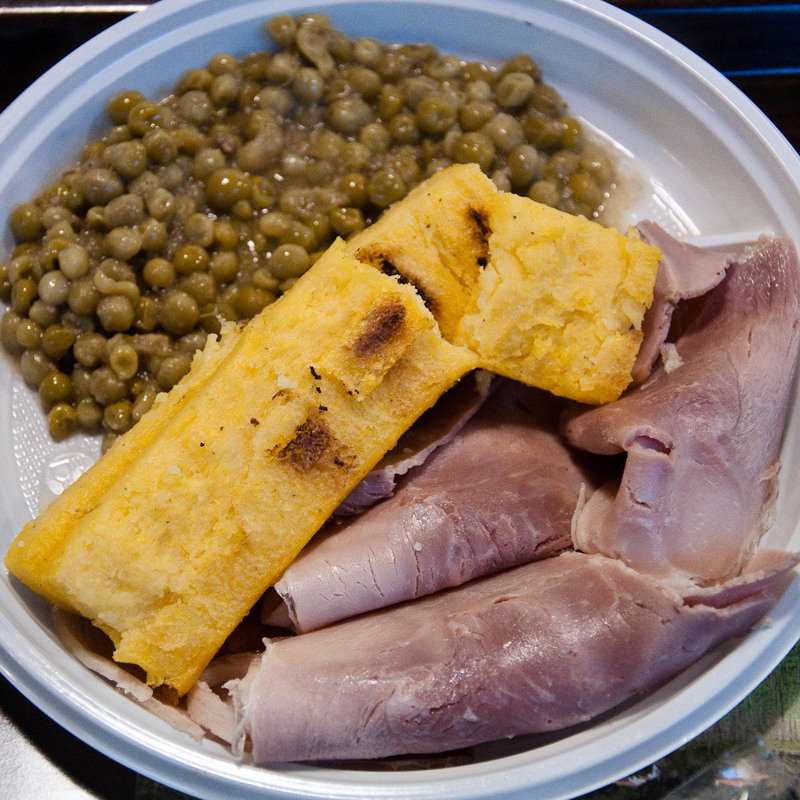 As it turned out, Lumignano is where the best peas in all of Italy are grown. Rows and rows of pea plants as high as a man’s head surround the village. Once a year the local pro loco organisation sets up a pea-celebrating festival over two consecutive weekends in May right in the midst of pea season. I clicked quickly all over the website. To my utter delight, it transpired that the festival was to begin last night and that, obviously, they were to serve risi e bisi. I called my husband at work with an offer he couldn’t refuse – let’s drive down to Lumignano and sample the dish as it should be. At around 8 o’clock last night we found ourselves in front of two large white marquees teeming with people. Volunteers from the pro loco organisation were manning the car park, the tills and the kitchen. These pro loco teams are one of the most interesting things of Italian life. They are set up to promote a particular place or local activity and work at grass-root level setting up events and festivals. Organisation at such happenings is always amazing. 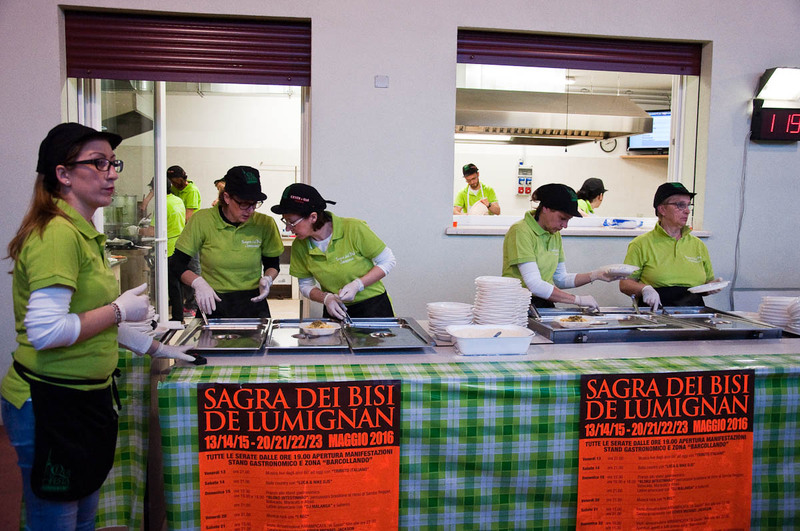 Even though the pro loco work is done by volunteers, they have such strong pride in their locality and the local produce that they are able to set up an event which runs like a clockwork. Pro loco in fact means ‘in favour of the place’ in Latin and many old crafts and traditions are kept alive thanks to the tireless work of these organisations. We walked into the first marquee and the smell of cooking enveloped us tightly. It was divine! We couldn’t wait to tuck in. 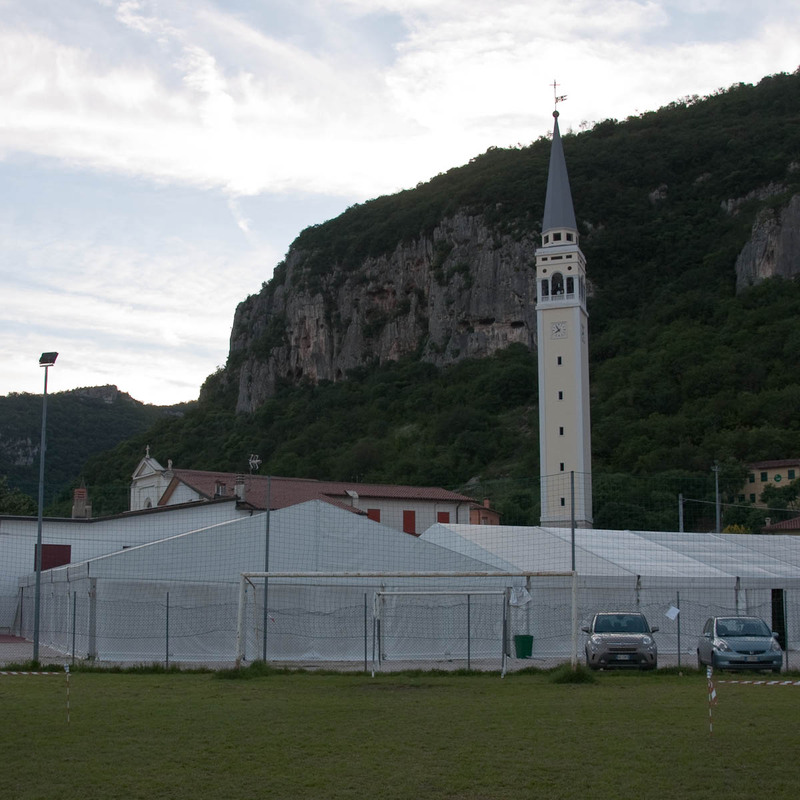 Large menus in both Italian and English were attached to the walls of the marquee. Leaflets with printed menus and pens were left on a long table right by the entrance. We took one, ticked off our selection and hotfooted it to the ‘Cassa‘ – a long counter behind which three or four local men were taking payments for the food. In front of each one of them there was a laptop and a small printer. The queue was moving fast. We paid and were handed a printed receipt for each dish we had chosen. Then we walked into the main area of the marquee. Long tables with benches on both sides had been set up all throughout it. To the right of us the kitchen and the serving station were working at high speed. All you had to do was to wait for the electronic display to show the number of your order, then give your receipts to the servers in pea-coloured t-shirts and wait for your food to be dished out. The atmosphere was buzzing. Whole families were seated around the tables, tucking into their risi e bisi and several other pea-based meals. 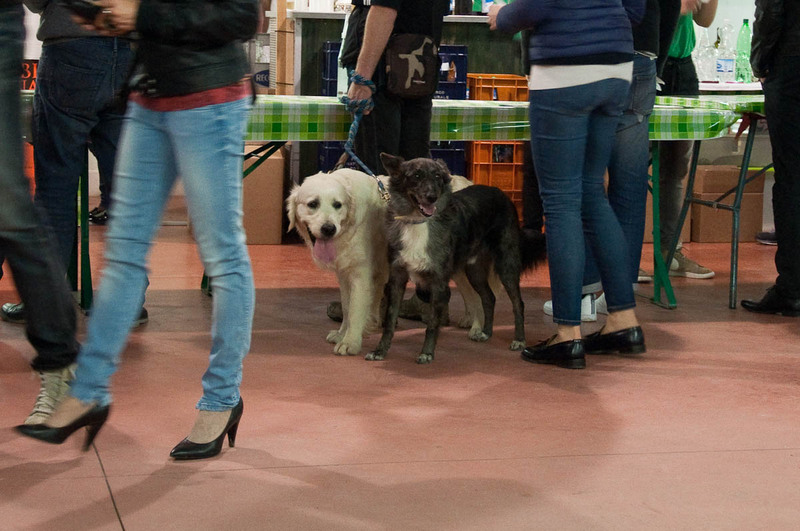 Kids were running around and some people had even brought their dogs in to take part in the celebration. It looked like the whole village of Lumignano and half of Vicenza were there. It was our turn. 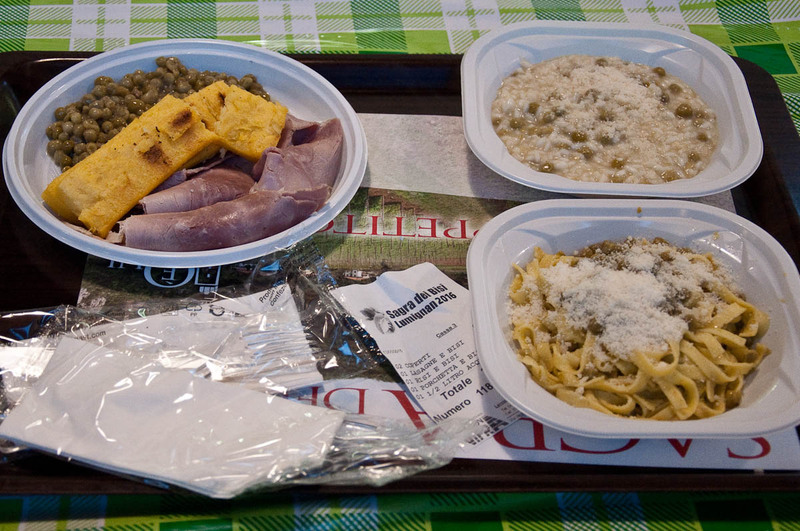 The lady behind the counter brought us the tray with our selection: risi e bisi (obviously), lasagna and peas, porchetta and peas. ‘Porchetta’ being boneless pork roast typical for Italy. As for ‘lasagna’, well, you have to know that here in Veneto, what we know as ‘lasagna’ is actually called ‘pasticcio‘, ‘whilst ‘lasagna’ is a type of long flat pasta. Tray in hand, we joined the merry people on the tables. Here is the right moment for me to tell you that ‘peas’ in Italian is actually ‘piselli‘. In Veneto though they are called ‘bisi’ in the local dialect. It is pronounced just like the English word ‘busy’, which obviously gave us a lot of food for jokes and play-on-words. Talking of food, everything we sampled at the festival tasted delicious! 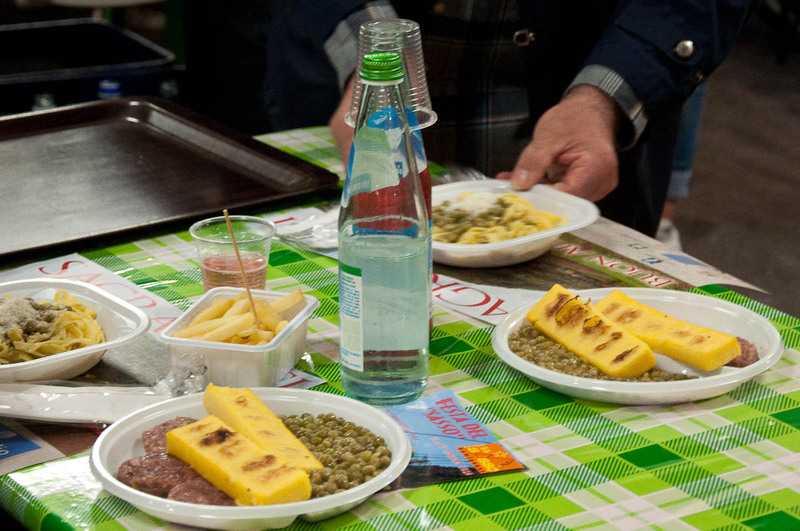 It is funny how at such single foodstuff festivals here in Italy, the food is always served in plastic plates, but tastewise it wouldn’t be out of place on the menu of a five-star restaurant. I don’t know if this is because the local cooks are really skilled in preparing the foodstuff to which the festival is dedicated or because the area is really famous for that particular foodstuff which is grown following centuries-old techniques and traditions. In any way, in spite of the unpretentious surroundings and the very humble prices, the food at such events is always first class. The risi e bisi were really ‘all’onda’, sliding towards the rim of the bowl, as I tilted it. The rice had a nice bite to it (nothing worse than rice which had spent far too long in the water) and the peas were soft as butter. The ‘lasagna’ pasta (generously sprinkled with hard cheese) was tasty just like the best handmade Italian pasta can be. And my favourite bit was the generous helping of peas served with the porchetta. They were soft and soul-satisfying. I could quite happily eat them every day for the next ten-twenty years at least. Then it was time for dessert. 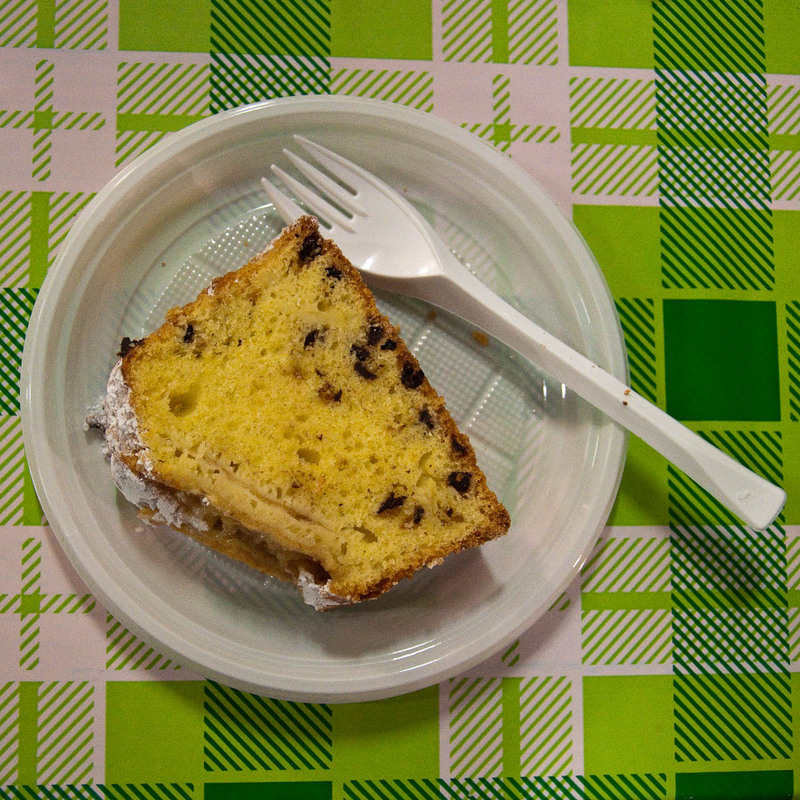 There were so many cakes to choose from at a humble 1.50 euros per slice. 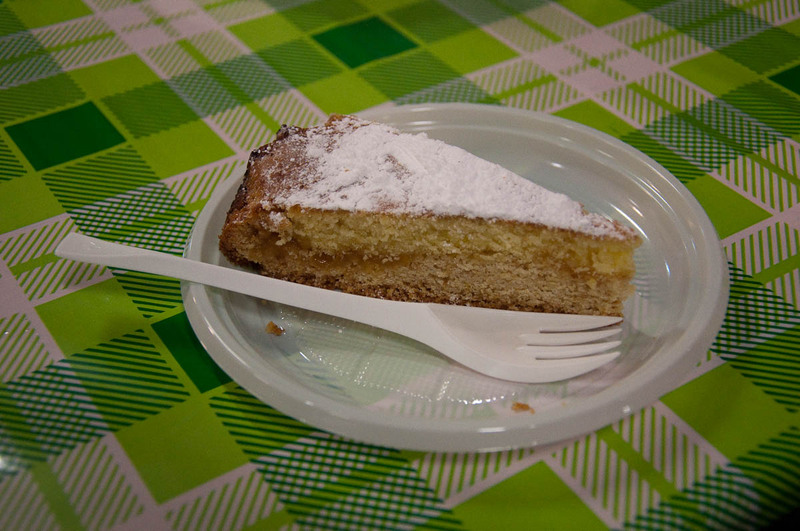 We got an apple cake, a jam crostata and a lemon cake, which was scrumptious. I really wanted to ask the ladies selling the cakes, if they have a patisserie or something, as they were so good, but among all the eating, munching and people-watching, I forgot to do it. If anyone knows who these ladies are and where else they sell their sweet creations, please, let me know! In the meantime, the second marquee was getting ready for the live entertainment session which was about to kick off at 9 pm. Each night of the pea festival there will be a live band and/or a DJ of different musical persuasion – from Italo disco through country to Latin American rhythms. Families with children and couples were waiting for the night to start in earnest. However, it was time for us to leave. But not before I had found the secret to how to cook perfect peas. I approached a trio of smiling ladies in pea-coloured t-shirts helping to clear up the tables of trays and dishes. ‘Excuse me’, I said in my best broken Italian, ‘but how do you cook the peas to make them so soft and tasty?’. They laughed, seemingly pleased that we were so interested in Lumignano’s best. ‘Do you have to boil them long?’, I enquired. ‘No, no! 10-15 minutes!’. Then, seeing our surprised faces, the smiling lady added: ‘The peas are fresh, they don’t take long. I don’t know about other peas, but the ones of Lumignano are very fresh and they don’t take long’. Of course! Now that I have tried them, I can guarantee you that the peas of Lumignano are not just the freshest, but also the best. If you are in the area, don’t miss the Pea Festival – it is on this weekend and the next. 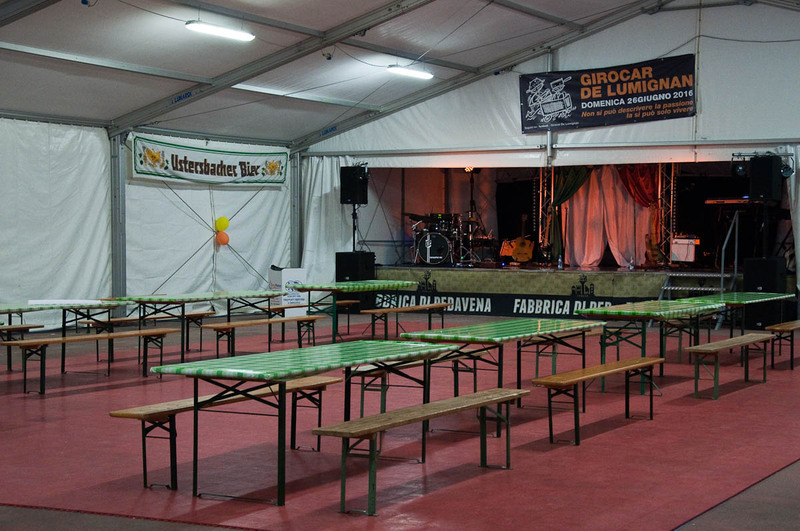 To leave your car in the car park by the marquees, you will be asked for a donation of 2 euros. The pea dishes start from 5 euros, side dishes from 2 euros and cakes are 1.50 euros a slice. 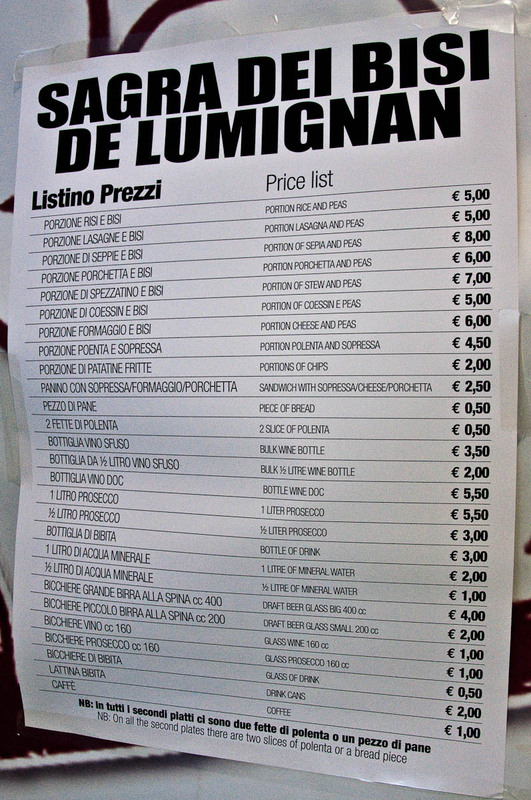 Drinks start from 0.50 euros for a glass of soft drink and go up to 5.50 euros for a bottle of wine or a litre of prosecco. There is live entertainment every night. Please, kindly note that I am in no way sponsored by the organisers of the festival. I just loved it there, paid for my own meals, found the food delicious and I am just sharing my honest opinion with you. 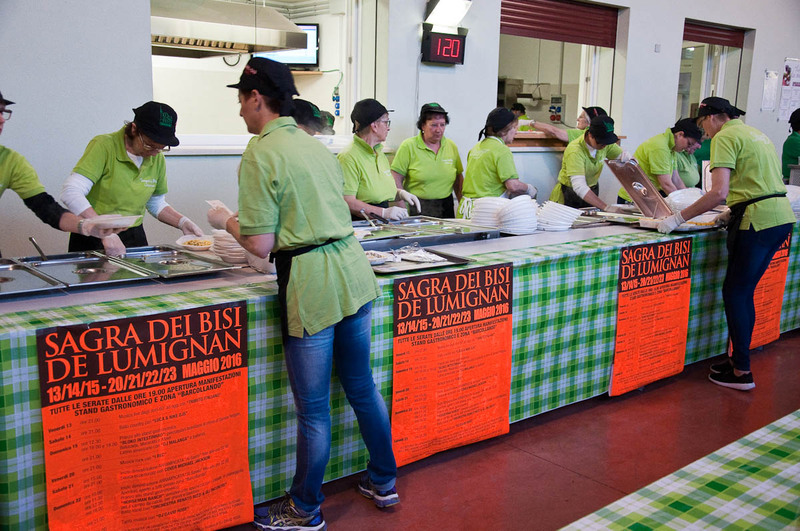 Have you been to a traditional sagra in Italy? Which foodstuff was it dedicated to? What were your impressions of it? We went to this last night. Such a beautiful location and great food!! 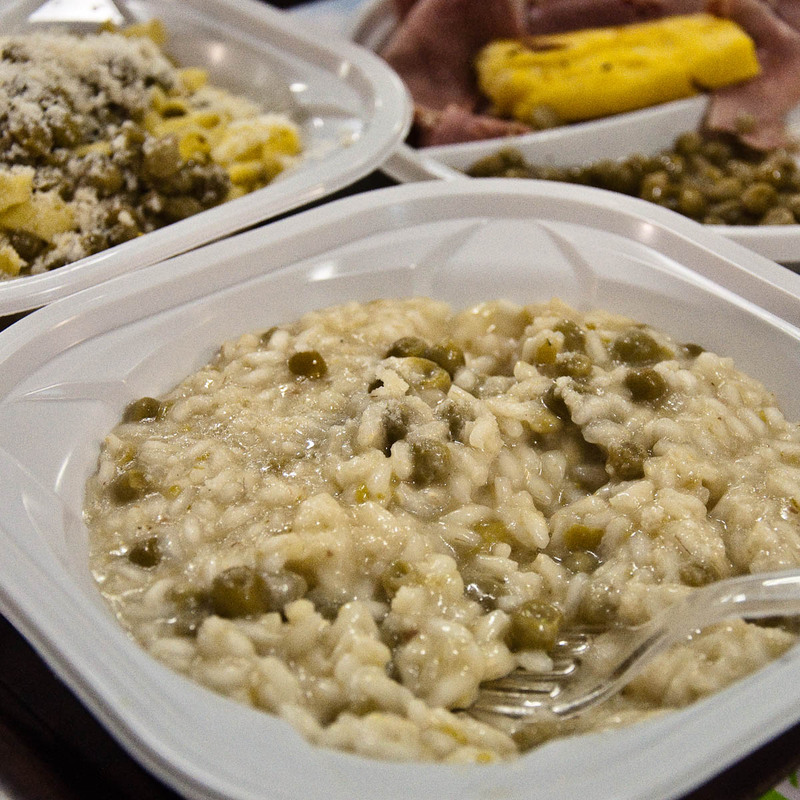 The pea risotto was my favorite.